The Laughing Gull is a small "black-hooded" gull that nests along the Atlantic and Gulf coasts of North America, the Caribbean, and northern South America; the northernmost populations migrate further south in winter. It is infrequently found away from the ocean, and is an irregular and rare visitor to Tennessee. Description: This medium-sized gull is overall slender, slaty-gray above and white below, with gray wings that are tipped with black. During the breeding season (March-September) the head is entirely black; in the non-breeding season (September-March) the head is mostly white with limited gray on the back. Juvenile (August-November) is overall dusky brown. Laughing Gulls reach full adult plumage in their third year. Voice: Call nasal laughing, kiiwa. Bonaparte's Gull is a fairly common, regular migrant and uncommon winter resident in Tennessee. During the non-breeding season it has a dark spot behind the eye, and is paler gray above with more white in the wing. 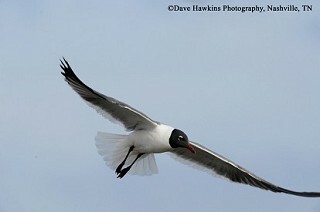 Franklin's Gull is a rare and irregular migrant in Tennessee. During the non-breeding season it shows a more extensive and darker patch on the back of the head, and more white in the wing. Ringed-billed Gull is the most regular, common migrant and winter resident in the state. It is larger with brown, not gray, on the head in the non-breeding season, a yellow bill with a black tip or band, and a white spot on the wingtip. Habitat: In Tennessee, may be found on or near large lakes and rivers across the state. Nesting and reproduction: The Laughing Gull has never been known to nest in Tennessee. Status in Tennessee: The Laughing Gull is an irregular, rare migrant, but has been seen in the state in every month of the year except January. Most sightings involve one to three birds. Egg and plume hunters nearly exterminated Laughing Gulls from their nesting colonies in the northeastern United States in the late 19th century. Due to protections (Migratory Bird Treaty Act 1918) and their ability to exploit human-made environments, populations have increased over the last century. Laughing Gulls are normally active during the day. During the breeding season they will forage also at night, especially along beaches, and will even hover to catch insects around lights. Burger, J. 1996. Laughing Gull (Larus atricilla). The Birds of North America, No. 225 (A. Poole and F. Gill, eds.). The Academy of Natural Sciences, Philadelphia, PA, and The American Ornithologists' Union, Washington, D.C.